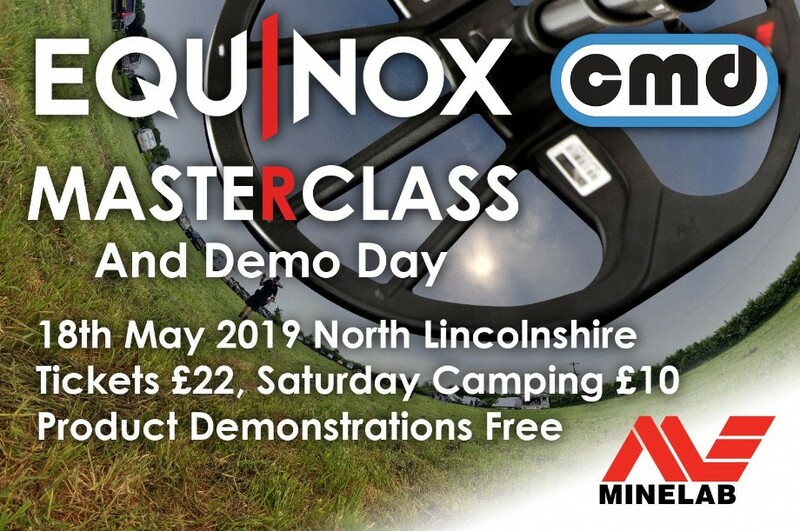 CMD proudly presents our second Minelab Equinox Masterclass & Demo Day, this May in North Lincolnshire. Join us for another day of fun with Minelab experts Derek McLennan, Sharon McLennan and Paul Cee as they help you to get the very best out of your Equinox. This time we have approximately 40 acres of recent pasture in an area well known for its Roman finds. The event will take place on Saturday the 18th of May with free detecting on the site on Sunday with camping available on Saturday night. Plus we will have detectors and accessories on demo so if you don't have an Equinox why not pop along and see what all the fuss is about. As a bonus anyone buying an Equinox from us between the 10th of April and the event date will be offered tickets for free! Tickets on sale from CMD website for £22, get one while availability lasts.